Need a portable afternoon snack? 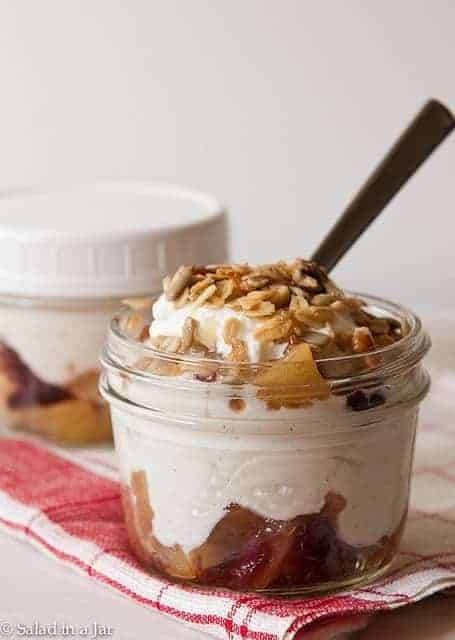 Try this Apple-Cranberry Yogurt Parfait with My Favorite Granola. Do you have a hungry hour in the afternoon? Mine is between 4 and 5 o’clock. My growling tummy makes like a ferocious bear, eating anything it can see, smell, or steal–even stale chips left on the free-for-all counter at work. My solution is Greek yogurt. All that protein satisfies and takes me to dinner-time without ruining my dietary day. I will admit yogurt is an acquired taste for some, but I love the taste and creamy texture of homemade fat-free Greek yogurt although I never eat it plain. I need additives–like fruit, granola, cream of coconut, vanilla bean paste, etc. Apple-Cranberry Yogurt Parfait is just the latest in my collection of Greek yogurt variations. To make this, you could buy apple pie filling in a can, yogurt in a plastic carton and granola out of a cardboard box. But at my house, I start with this “Apples in a Bag” recipe with 1/4 cup dried cranberries substituted for the raisins. Then I grab some nonfat Greek yogurt saturated with vanilla bean paste so it has lots of black specks. Love those specks! 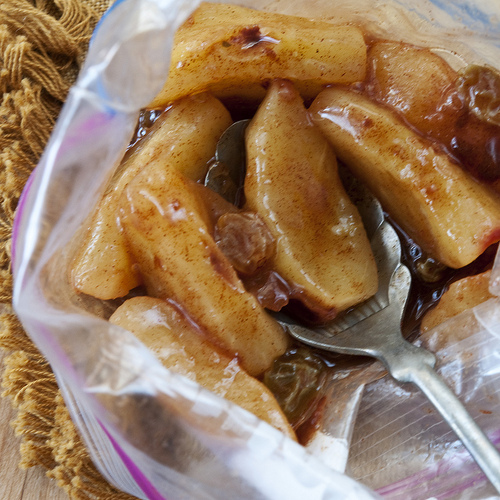 “Apples in a Bag“–an easy, low-calorie way to cook apples. Because I take this to work, I construct the parfaits in 6-ounce Mason jars with a lid to make the whole thing portable. 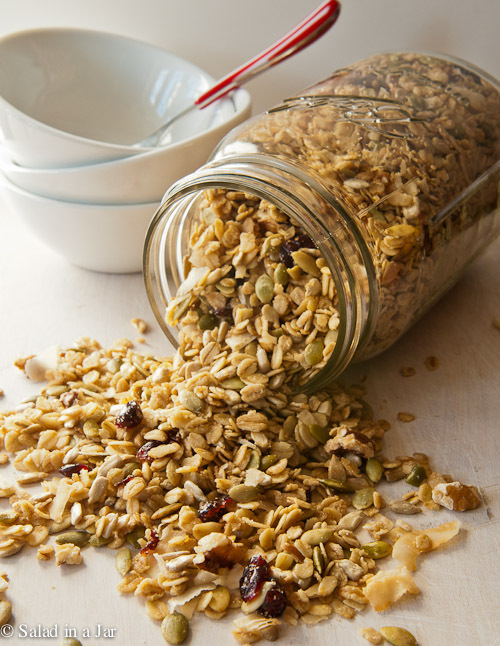 Store the granola in a separate container if you don’t plan to eat it immediately. In case you’re looking for a good granola recipe, this is my favorite as of late. This granola is not your normal grocery store variety. It’s not at all powdery or clumpy. Instead, each ingredient is clearly identifiable, crackly and crunchy. The sweetness contrasts nicely with the tang of Greek yogurt. Modifications of the original recipe include increasing the amount of oatmeal from 3 to 4 cups to slightly dilute all that olive oil, maple syrup, and brown sugar. In the end, I can tell no difference in the flavor or texture. Because I buy dried fruit from Costco, I feel compelled to add fruit–usually raisins and dried cranberries– to nearly every recipe I can. This is no exception. Chopped dates are good, too. My favorite ingredient is coconut flakes (shaved coconut). 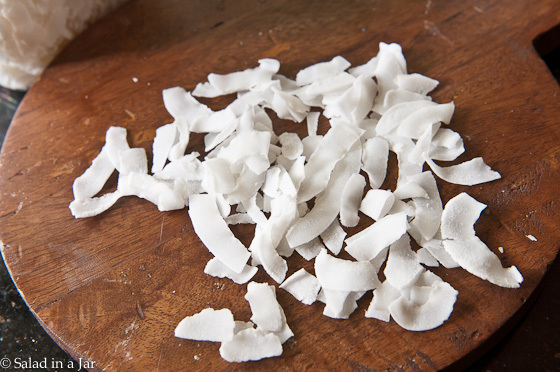 Of course, you could substitute shreds, but coconut lovers will appreciate the bigger pieces of coconut. It’s fun to pick them out of the mix and eat those toasty babies individually when no one is looking. Krogers sells shaved coconut in the same area as shredded coconut. Check specialty markets, too, and don’t forget to look in the bulk section to save money. My Favorite Granola is sweetened with brown sugar and maple syrup. Good for breakfast. Even better with yogurt. Combine first seven ingredients in a large mixing bowl with a large spoon or your hands. Pour maple syrup and olive oil over oatmeal mixture and continue mixing. Spread in a thin layer on a greased full-sheet cookie tray. 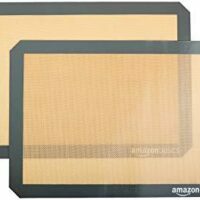 Or, cover your tray with parchment paper or a silicone baking sheet for easier clean-up. 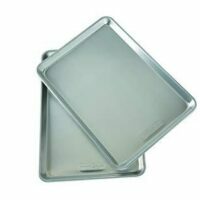 Bake in oven preheated to 300 degrees for 45 minutes, stirring every 15 minutes. Add dried fruit 5 minutes before granola is done. Allow to cool completely before storing in glass jars or plastic bags. Makes 1/2 gallon plus one pint. 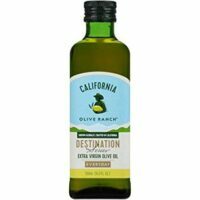 For you vacuum-packers, put this in quart jars and vacuum-pack for long-term freshness. Thanks to you, I took the plunge and made yogurt today. Since I have never eaten it, I’m actually not sure how it is supposed to taste. I went with a slightly sweetened version with a touch of vanilla. I think with all the possible variations I’ll be able to find a few add ins to give it a wow factor. The granola topping looks wonderful. I’ll have to add maple syrup to the list and make it! What a great afternoon snack…looks delicious, and very tasty…yum! This looks delicious, I love that granola and those apples in a bag look wonderful. Are the coconut flakes sweetened? That seems to be the only kind you can find around here, even at W**** F****! Nice! They have coconut flakes at Costco now, too, in case you missed them there. I love coconut! Yes, I have missed them. But I will add to my list for my next trip. Thanks for the info. Hi Paula. I made your yogurt last weekend again. Can not wait to make your granola. I love your blog so much. Love how you like to make everything from scratch. Thank you and have a super weekend. I will definitely be trying this soon! Also great for hitting that after dinner sweet spot. Where did you get those white lids for your jars? I’ve purchased those lids at Walmart, Krogers, and a hardware store that sells canning supplies. Love them! I just love your description of granola- “oatmeal cookies without the eggs and flour!” It really is too easy to eat. 🙂 I still haven’t made your yogurt, but it’s one of my goals for this summer. This flourless granola will be perfect for parfaits!